We love a bit of baking! And as well as our chocolate celebration cakes we make all sorts of baked goodies. 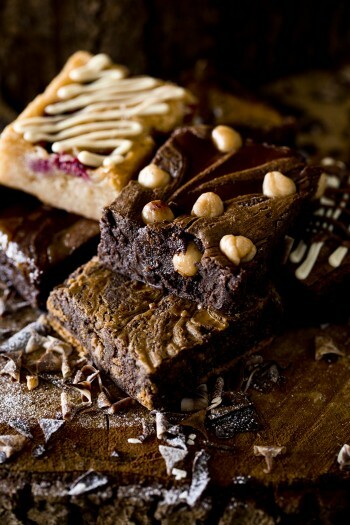 Our speciality is the brownie, both our original very chocolatey brownie and a huge number of flavours which we vary throughout the year! Dark Chocolate (min 70% cocoa solids): Sugar, cocoa butter, emulsifier: soya lecithin, vanillin. Sugar, butter (milk), eggs, wheat flour, vanilla extract, salt. Dark Chocolate (min 70% cocoa solids: Sugar, cocoa butter, emulsifier: soya lecithin, vanillin. Sugar, butter (milk), eggs, wheat flour, vanilla extract, salt. Orange juice and zest, orange paste (glucose syrup, invert sugar syrup, orange juice concentrate, colouring plant concentrates (carrot and pumpkin), natural orange flavouring, ethanol, acidifier citric acid. Salted caramel: sugar, water, double cream (milk), vanilla extract, salt. White Chocolate (min 29% cocoa solids): Sugar, cocoa butter, whole milk powder emulsifier: soya lecithin, vanillin. Sugar, butter (milk), eggs, wheat flour, ground almonds, vanilla extract, salt. Raspberries. Dark Chocolate (min 70% cocoa solids) Milk: Sugar, cocoa butter, emulsifier: soya lecithin, vanillin. Sugar, butter (milk), eggs, wheat flour, vanilla extract, salt. Biscoff spread and Lotus biscuits: wheat flour, sugar, vegetable oils (palm oil from sustainable and certified plantations, rapeseed oil), candy sugar syrup, raising agent (sodium hydrogen carbonate), soya flour, salt, cinnamon, rapeseed oil, sugar, emulsifier (soya lecithin), acid (citric acid). Honeycomb pieces: Cinder Toffee: Sugar, glucose syrup, bicarbonate of soda, wheat flour. Peanut butter: Roasted peanuts, sugar, hydrogenated palm oil, salt. Raspberry Jam: Sugar, raspberries, acid (citric acid), gelling agent (pectins). Espresso powder, Mocca bean: Milk chocolate, cocoa: 30 % minimum (96%) with coffee (3%) Sugar; whole milk powder; cocoa butter; cocoa mass; sweet whey powder; coffee (3 %); glazing agent: gum arabic (E 414), emulsifier: soya lecithin; flavour. Maltesers: Sugar, skimmed milk powder, cocoa butter, glucose syrup, barley malt extract, cocoa mass, palm fat, lactose and protein from whey (from milk), whey powder (from milk), milk fat, wheat flour, emulsifiers (soya lecithin, E492), palm oil, raising agents (E341, E500, E501), salt, glazing agent (pectin), natural vanilla extract. Mars Bar: sugar, glucose syrup, skimmed milk powder, cocoa butter, cocoa mass, sunflower oil, milk fat, lactose whey powder (from milk), palm fat, fat reduced cocoa, barley malt extract, emulsifier (soya lecithin), salt, egg white powder, hydrolysed milk protein, natural vanilla extract. May contain peanut. Rolo: glucose syrup, sugar, whole and skimmed milk powder, invert sugar syrup, vegetable fat (palm, shea, illipe,mango kernel, kokum gugi, sal), cocoa mass, cocoa butter, sweetened condensed milk, lactose and proteins from whey (from milk), whey powder (from milk), butterfat (from milk), emulsifier (sunflower lecithin), salt, flavourings. White Chocolate (min 29% cocoa solids) Milk chocolate (min 33% cocoa solids) : Sugar, cocoa butter, whole milk powder emulsifier: soya lecithin, vanillin. Sugar, butter (milk), eggs, wheat flour, vanilla extract, salt. Nutella: Sugar, palm oil, hazelnuts, fat reduced cocoa, skimmed milk powder, emulsifier (soya lecithin), vanillin.